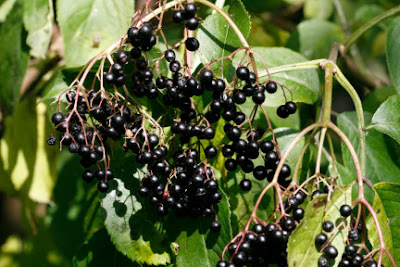 Elderberry juice has been used for many years by native Americans and others to help enhance the immune system. Several years ago, my dad and step-mom started making elderberry jelly. Not only did it make breakfast special (elderberry jellies and jams are delicious), the health benefits were great. We used it as an herbal medicine for colds and as a flu medicine. Elderberry has nine times as much vitamin C, more than twice the calcium, and 7.5 times as much vitamin A as grapes. One of the most important vitamins when you have colds or flu is vitamin C, so elderberry is a good choice. Dad is gone now, and my step-mom doesn't can jellies like she once did. My family really misses the wonderful flavor of their jellies and jams. During the winters that we had elderberry jelly for breakfast several times each week, colds and flu were drastically reduced in our home (please see note at bottom of the page). Now, in lieu of Dad’s homemade jellies, my family now takes elderberry capsulesmade with elderberry and elderflower components to get the same benefits. We also use elderberry syrup in smoothies. Just add a tablespoon of the syrup to a full blender of your favorite fruit smoothie. Delicious! and grow them yourself. If you do have them locally, take care in handling, use gloves to prevent skin irritation and staining, and do not allow children to help you with them. The stems are toxic and there have been reports of poisoning in children who used the easily hollowed stems for pea shooters. Raw berries should not be eaten. They contain hydrocyanic acid and can cause diarrhea. This toxic substance is totally destroyed by the cooking process. Crush the berries, or put through a fruit strainer for jelly. In a heavy 5 quart pan, add the sugar and vinegar. Cooking over low heat, bring the mixture to a boil. Stir often until all the sugar dissolves. Continue stirring frequently to keep jam mixture from sticking to the pan. Boil until the jam mixture begins to thicken. While still hot, pour into three clean pint jars. Be sure you leave 1/4 to 1/2 inch of space at the top. Place the canning lids on the jars and tap lightly to remove the air bubbles that may be present. Screw rings on firmly. In a large pot, bring three inches of water to a rolling boil. Put the jam jars into the boiling water and leave for 10 minutes. Using canning tongs, remove the jars from the water and let them cool overnight. My mom always turned jelly jars upside down while they cooled to help them seal better. Be sure not to clink the jars together. While they are very hot, they will break easily. Refrigerate the jam after you open it. Note: These statements have not been evaluated by the Food and Drug Administration. This recipe is not intended to diagnose, treat, cure or prevent any disease. Have you ever eaten elderberry jam or jelly? We just made elderberry jelly at our house this week. So yummy. Thank you for commenting, Cara. I would love to have your elderberry jelly recipe. Do you have a link to it?